As many as 26,000 U.S. schools serving up to 14 million students may be contaminated with unsafe concentrations of toxic polychlorinated biphenyls (PCBs) leaching from caulks, sealants, and other aging building materials and fixtures, according to a recent study by scientists at the Harvard T.H. Chan School of Public Health. Sen. Edward Markey, D-Mass., analyzing the Harvard findings, has calculated that up to 30 percent of American children in elementary, middle and high school may still be exposed to these dangerous industrial chemicals, despite a 1976 ban by Congress. PCBs were the only family of chemicals for which such action has been taken. PCBs, manufactured from the 1920s to the 1970s by Monsanto, were once used as insulators for electrical equipment, oils for hydraulic systems and motors, plasticizers in paints and caulks, components of fluorescent light fixtures, and ingredients in consumer products such as carbonless copy paper. The World Health Organization categorizes PCBs as carcinogens. These chemicals can also cause a variety of health problems, harm to the immune system, neurological damage, learning deficits, lowered birth weight and decreased thyroid hormone function. School children are most often exposed to these chemicals by old, PCB-laden caulk and outdated fluorescent light ballasts. They may also come in contact with PCBs that migrated into paint, floor finishes or soil outside. According to data the Environmental Protection Agency provided to Markey’s office, which was also analyzed by EWG, over the past 10 years the EPA has received 286 reports of potential PCB contamination in school buildings in 20 states. These incidents ranged from the removal of a single fluorescent light fixture to large-scale remediation undertaken by some of the nation’s largest school districts. Moreover, an unknown but probably substantial number of students and teachers in numerous colleges and universities come into frequent contact with PCB-laden materials. Click on your state in the map below to see available PCB contamination records. Many states have not tested for PCBs in schools, so no data are available. These states appear grey in the map. Click on your state in the list below to see available PCB contamination records. Many states have not tested for PCBs in schools. 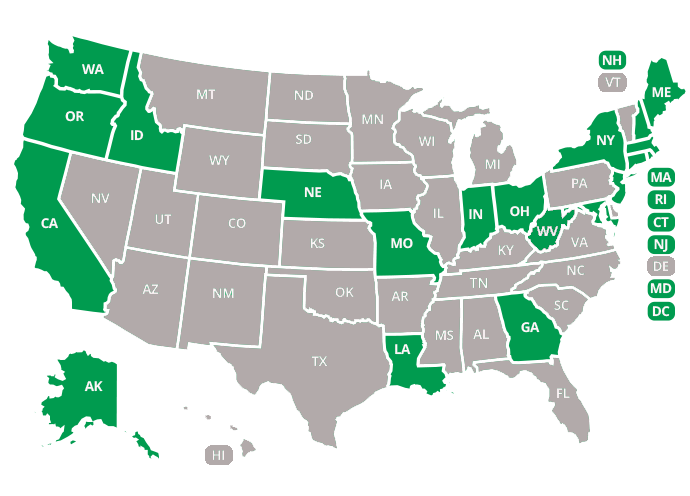 Only states with available data on PCB testing appear in the list. These data demonstrate that PCBs in schools are a national problem. And while the scope of the problem remains poorly characterized, it is clear that where people look for PCBs in schools, they are very likely to find them. The presence of PCB contamination in our schools causes elevated blood PCB levels among both teachers and students. The effect of these PCBs on the health of people in these buildings has never been studied, but given the evidence that PCBs cause cancer, and reproductive and developmental problems, it is essential that this source of PCB exposure be eliminated from our schools. Not long after Monsanto started producing PCBs, the company discovered they were health hazards, but hid that information from the public and regulators. This began a decades-long cover-up, the likes of which is unmatched in the annals of corporate environmental malfeasance, and was not fully revealed until internal company documents were unearthed in lawsuits. In 2003, thousands of these documents were made public in EWG’s Chemical Industry Archives, which documented the shocking story of Monsanto’s callous poisoning of Anniston, Ala. The most urgent questions surround possible contamination in the tens of thousands of schools that may not have been tested for PCBs, but are at risk for having them. Any school building constructed between the 1950s and the late 1970s could test positive for these chemicals, potentially endangering the health of students and teachers. Schools built in this time frame should test for PCBs in caulk, dust and in the air. School systems with old fluorescent light fixtures should develop disposal and replacement plans. PCBs are known to cause a reduction in learning ability and IQ. The last thing you want in a school is to have children exposed to a neurotoxic chemical that will reduce their ability to learn. PCBs in materials like caulk or leaking fluorescent light ballasts slowly volatilize, and children and teachers will inhale these vapor-phase PCBs continuously while in a PCB-contaminated school. Caulk made in the 1950s to 1970s commonly contained PCBs. The material can break down to release PCBs that can migrate into air and adjacent structural materials such as bricks, mortar, concrete and soil. Under EPA regulations, materials with more than 50 parts per million of PCBs must be removed or properly remediated. In recent tests at two schools in Malibu, Calif., caulk concentrations of PCBs up to 570,000 parts per million have been found, vastly exceeding the EPA limit. Earlier this month, in response to a citizen’s suit filed by parents of school children against the Santa Monica-Malibu school district, a federal judge in Los Angeles ordered all PCBs removed from two Malibu schools. However, the EPA does not require schools to test for the presence of PCBs. No national database exists that summarizes whether buildings were tested, levels of PCBs in caulk detected in various buildings that were tested, the remediation measures undertaken and whether these measures were effective. Even when school systems remove caulk and other PCB-laden materials, the chemicals may linger in other adjacent materials, such as wooden window frames, brick and stucco, which is why confirmation testing after PCB removal is essential. The EPA acknowledges that all fluorescent lights that contain PCBS currently in use have exceeded their designated life spans. It is unknown how many of these light fixtures have already been removed and how many remain in use. These lights are at a heightened risk of rupture, leaching and crumbling, increasing the chance of subsequent PCB exposure for people in the buildings. Cleanup costs after a rupture could be significant. The EPA recommends that any fluorescent light fixture that contains PCBs should be removed. But the agency does not require removal unless PCB-contaminated liquid is leaking out of the light fixture. Children may be exposed to a wide range of environmental hazards in schools – not only PCBs but also asbestos, radon, mold, cleaner chemicals, pesticides, and lead in drinking water. Like PCBs, asbestos and radon are still found in schools across the nation. A 2012 report by CNN estimated that one-third of U.S. schools have mold, dust and other indoor air pollution problems. With the exception of asbestos, in most cases schools are not required to regularly monitor or remediate these environmental hazards, nor are they required to even notify parents that these hazards may exist. While this report focuses on the health risks of PCBs in schools, American school systems and the communities that support them need a substantial investment in school infrastructure to eliminate many types of environmental hazards. 1 Robert F. Herrick et al. 2016. Review of PCBs in US Schools: A Brief History, an Estimate of the Number of Impacted Schools, and an Approach for Evaluating Indoor Air Samples. Environmental Science and Pollution Research, 23(3):1975-1985. 2 Complaint at 30, Am. Unites for Kids v. Lyon, 2016 U.S. Dist. LEXIS 118447 (C.D. Cal. Sept. 1, 2016) (No. CV 15-2124). See also, Susan Klosterhaus et al. 2014. Polychlorinated Biphenyls in the Exterior Caulk of San Francisco Bay Area Buildings, California, USA. Environment International, (66):38–43. 3 Am. Unites for Kids v. Lyon, No. CV 15-2124, 2016 U.S. Dist. LEXIS 118447 (C.D. Cal. Sept. 1, 2016). 6 Kathleen W. Brown et al. 2016. PCB Remediation in Schools: A Review. Environmental Science and Pollution Research, 23:1986-1997.